Sources said the contractor has now been asked not to proceed with any construction activity. Days after the Supreme Court (SC) issued a notice to the Maharashtra government while hearing a special leave petition filed by the Conservation Action Trust (CAT) regarding the statue of Maratha warrior king Chhatrapati Shivaji in the Arabian sea off Mumbai, the state PWD has asked the contractor for the project to stop work with immediate effect. Officials said they expect this to delay the project. Sources said that government pleader Nishant R Katneshwarkar has communicated to the state that on January 11, the SC, while hearing the petition, had issued a notice seeking the state’s response. The pleader, in his communication, has also said the court “orally asked the state not to proceed with the construction activity” and further asked the government “to issue appropriate orders to that effect”. Sources said the contractor has now been asked not to proceed with any construction activity. “We will have to file a counter affidavit in response to the petition. We will draft the affidavit immediately as the pleader has asked us to treat this as most urgent,” said an official. The CAT has challenged the Bombay High Court’s decision not to grant a stay on the project. The CAT, in its petition before the HC, had objected to the Ministry of Environment, Forests and Climate Change (MoEF) exempting the public hearing process for the project through a notification in February 2015. Officials conceded that the stop work order to the contractor is a major setback for the government. “The contractor has initiated the work of setting up a temporary platform for loading and unloading of material for the construction activity. Now, the stop work directions will further delay the project,” said an official. 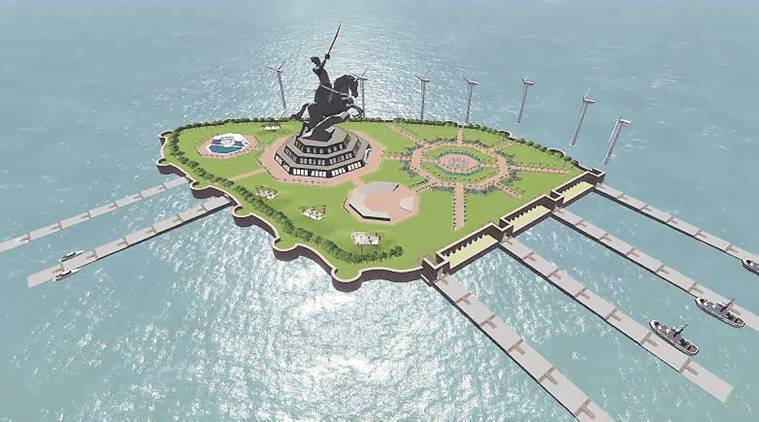 The Shivaji memorial — 212 metres in height, including a 123.2-m statue standing atop an 88.8-m pedestal — is a flagship project of the BJP-led government in the state. Prime Minister Narendra Modi had conducted a jalpoojan in December 2016 for the project. The official added that the PWD is reviewing whether to make any payment to the contractor as a “mobilisation advance”. As per the contract agreement, the mobilisation advance has been pegged at Rs 144 crore, five per cent of the total contract cost of Rs 2,890 crore, the official said. Meanwhile, APLI Mumbai, an NGO, has written to the general administration department and the PWD, asking them not to make any payment to the contractor until further orders of the court. “The government should not make any payment to the contractor as it will be wasteful expenditure of public funds,” said Vice Admiral (retd) I C Rao of APLI Mumbai.